The real-life counterparts of the extravagantly wealthy characters in new movie Crazy Rich Asians are "very interested in modern architecture", says the architect of a contemporary home featured in the film. Private clients in the economic powerhouses of Southeast Asia have acquired a taste for more minimal design that has fuelled a stylistic shift, said architect Stephanie Maignan of Toronto-based B+H Architects, who worked extensively in the region for over a decade. The house she completed in the jungle outside Kuala Lumpur in 2014 – which was recently used to film scenes for Crazy Rich Asians – provides a perfect example of this, she told Dezeen in an exclusive interview. "In that part of Asia, people are very interested in modern architecture and doing something to differentiate themselves," said Maignan. "Asia has just been going through this boom of development," she continued. "So the experience of working in an emerging economy is pretty exciting, because a lot of projects are aspirational and a lot of the clients are pretty forward-looking." Depicted as the Singapore home of wealthy matriarch Eleanor Young in the movie, the Be-Landa residence staggers up a steeply sloped site as three volumes facing a forest reserve, with the upper two volumes lifted above the ground on stilts. "We wanted to befriend this slope so we could keep this heavily forested, sloping lot and have a treetop feel to the house," said the architect. The project is among 30 that Maignan completed with her architecture firm 29Design, which she established in Kuala Lumpur in 2005 with Malaysian architect and partner Amanda Teh. Maignon said that the Singaporean glitterati represented in the blockbuster film – adapted from a novel of the same name and released August 2018 – are similar to the affluent and adventurous clientele that propelled her business. However, she admits that the Kuala Lumpur lifestyle is slightly "more low key". "There is a lot of opportunity for architects in Asia," she said. "I think this movie was showcasing that and talking about some of the 'bling bling' lifestyle." "I would say that some of our clients might fit into that category," Maignan added. The Be-Landa house was in fact completed for a Dutch family, who had been living in Malaysia for several years. Maignan believes the Crazy Rich Asians producers took a shine to the building's impressive tropical setting and open-plan layout, which faces onto an infinity pool, when selecting the residence over other contenders. "Sometimes when doing movies they look for a room without walls, that's ideal for filming as well," she said. "Also I think the jungle setting, it's quite close to the city but it doesn't feel like it." Eleanor Gibson: Could you tell me a bit about the concept for the Crazy Rich Asians house? 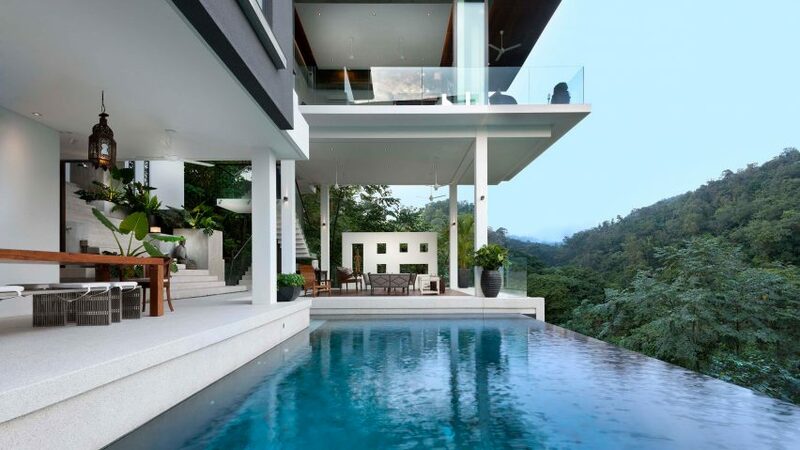 Stephanie Maignan: The client bought a very steeply sloping lot in the jungle facing a forest reserve on the outskirts of Kuala Lumpur, and the lot was sloping down from the road, from the entrance level. The challenge for us was: how do we befriend the slope, rather than try to conquer the slope? Our starting point was trying to figure out the minimum amount of flat land we would need for the house to be functional. We did some studies on how to get in with the car, and fit a three-car porch, and the depth needed for an entrance sequence. That became the data for the architecture to negotiate the slope. Our concept was massing the house as three pavilions with different relationships to the retaining wall where the flat area is. The first pavilion was on the slope and it's what you see from the street when you enter. The second pavilion was half on half off, perhaps sitting on stilts, and the third pavilion was completely out over the slope on stilts, quite high above the existing level. It was more than 15 meters above the existing contours. We came out with that massing concept in the very early stage and we also knew that our client – which is actually a Dutch family that had been living in Malaysia for a long time – loved the tropics, so they wanted the maximum amount of outdoor living to be incorporated into the layout, and they wanted to keep this forest feel. We wanted to befriend this slope so we could keep this heavily forested, sloping lot and have a treetop feel to the house, and use the space at the lower level. Eleanor Gibson: How did the project come about for you? Stephanie Maignan: I moved to Kuala Lumpur in 2002 after working at Weiss Manfredi in New York for a few years. Shortly after moving to Kuala Lumpur, I had the opportunity to start a firm there with my partner Amanda Teh, who is Malaysian. We started together in 2005 and the Be-Landa house was one of the earlier projects that we got together. Eleanor Gibson: How did you find your time in Kuala Lumpur? What kind of opportunities are there for architects there? Stephanie Maignan: I would say it was an amazing experience because Asia has just been going through this boom of development. So the experience of working in an emerging economy is pretty exciting because a lot of the projects are aspirational, and a lot of the clients are pretty forward-looking. Our first client was actually younger than we were. We were 29 when we started the firm and he was 26 and a developer. That was the project that we started the firm with. Things move pretty fast in an emerging economy and I would say in that part of Asia, people are also very interested in modern architecture and doing something different to differentiate themselves. That was quite a pleasure. There is a lot of opportunity in Asia for architects. I would say there are also challenges working in another culture that are character building, but it was good fun. Eleanor Gibson: How did it come about for the house to be used in the film? Stephanie Maignan: There was a location scout that was looking for locations within Southeast Asia for this movie. He didn't say which movie it was for but he called our office asking if any client would be willing to have their house in the film, because not all clients are okay with that. We put the location scout in touch with our client, and they were actually really keen and thought it would be quite cool to have that experience. So the Be-Landa house was shortlisted and then it ended up getting selected as the site for Eleanor Young's bible study group. We didn't know until after the house was selected which movie it was for. John Chu [director of Crazy Rich Asians] came to view the shortlist of the locations and ended up selecting the house. At that point our client had already moved in and had the chance to meet with John Chu too. They spent about five days filming in the house, including the time to set up and dismantle – they arrived with all their own furniture. Eleanor Gibson: What do you think it was about the house that swayed their decision? Stephanie Maignan: If I were to guess, when we designed the house, the client wanted to have these very outdoor rooms without walls. They have an outdoor living area and an indoor living area, which is on top of it. We designed it so that the sliding doors completely open, they disappear from view. Sometimes when doing movies, they want a room without walls, as that's ideal for filming as well. Also I think the jungle setting, as it's quite close to the city but it doesn't feel like it. Eleanor Gibson: How did you find it as a representation of living in Southeast Asia, compared to your time there? Stephanie Maignan: In terms of the "Crazy Rich Asian", I think we were in a different universe, although I would say that some of our clients might fit into that category. Tropical Box house in Kuala Lumpur is wrapped in a concrete "egg crate"
There's definitely a lot of economic activity and development over there, and so I think this movie was showcasing that and talking about some of the "bling bling" lifestyle. Kuala Lumpur is more low key, so we don't see as much of that over there, but there is definitely an area of affluence and a lot of developments. So you do feel that when you're there, which was maybe a surprise when you think of an emerging economy, or a developing country. I think there was more of that than I anticipated before going there. Photography is by Lin Ho.